I really LIKE that they only have the most common items because it keeps me from getting distracted and spending and extra hour at the store checking out new things, comparing similar items, etc. And it saves me money and calories because I usually end up buying some new sweet thing at a traditional store. You are so right about their customer service. If you email, be prepared for a call back from your regional manager. They ALWAYS call (at least around here) because they want to whole scoop from you and they want you to know they that they have addressed the issue or if you left a nice comment, that they really appreciate the time you took to leave feedback. I definitely like Aldi and shop there most weeks. They admit to being about 80% of what a family "needs" on a given week. Occasionally I have issues with their produce and I don't like that they put high fructose corn syrup in almost everything. (I try to shake the sugars when I can and buy organic produce.) Those complaints lodged, I *do* really like them and spend about 70% of my grocery budget there. I also budget for a Door To Door Organics box to come to my home for fresh, organic produce for things like apples, non-peelable fruit, root veggies, and leafy greens. But on the flipside, I get my frozen fruits, peelable fruits (like bananas), etc. from Aldi. Between the two I barely have to go to a "regular" grocery store. Sometimes when I feel "rich" I'll go to Trader Joe's, which is actually owned by... Aldi. Well, to be fair the Aldi's people know in the USA is "Aldi Süd" (or Aldi South) and TJ's is owned by Aldi Nord (Aldi North) but still... Okay I'm done blabbering! 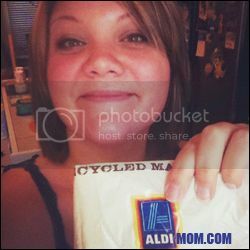 Aldi isn't the end-all-be-all, but it's an amazing tool in a mom/shopper's toolbox!